Spring is just around the corner. 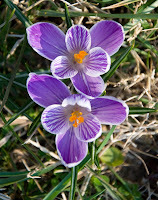 My little snow crocus are just about gone, but the larger ones are starting to take their place. I was always fascinated by crocus when I was little and I promised myself I would have them in my yard when I had a home of my own. I kept that promise and have been planting the bulbs each fall for nearly 30 years! When the squirrels leave them alone, I have a nice showing in the spring. They always give me hope that the native wildflowers won't be far behind. We had a lot of woodpecker activity at the feeder this morning. I enjoyed watching the Downy, Yellow-bellied, Red-bellied and Pileated woodpeckers when the came to the tree behind the house. 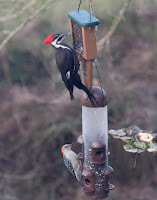 It was exciting to see the female Pileated and Red-bellied on the feeder at th e same time. I caught the Pileated in the middle of blinking her eye, so she looks a little strange! ***Update: Unfortunately, I don't think the woodpeckers are going to nest in the tree in front of the house, I'm afraid the pesky starlings ran them off. :( I got my hopes up last week when I watched a bluebird couple checking out a new house I put in the dogwood tree last fall. It must not have fit their expectations, it doesn't look like they are going to use it. 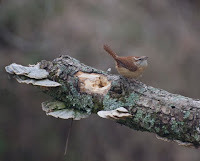 Maybe the wrens will find it to their liking!